DUMAS, TX, April 10, 2012 – To better serve their customers, Nelson-Jameson, Inc. will open a branch in Dumas, Texas. Operations will begin on May 1, 2012 and allow South Central food and beverage manufacturers to place a single order and receive plant supplies in a more-timely and cost efficient manner. The company’s newest location at 100 Success Boulevard, Suite 1 in Dumas, Texas features 8000 square feet of warehouse and office space. Nelson-Jameson, Inc. has been an integrated supplier for the food industry since 1947. Product lines include safety & personnel, production & material handling, sanitation & janitorial, processing & flow control, laboratory & QA/QC, and bulk packaging & ingredients. The company is headquartered in Marshfield, Wisconsin, with other locations in Turlock, California, Twin Falls, Idaho, York, Pennsylvania and soon Dumas, Texas. For more information visit, www.nelsonjameson.com. 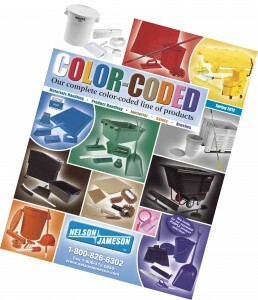 Color-coding is an important topic for food processors and at Nelson-Jameson, Inc. we understand this. We continue to work with our suppliers to provide the products necessary for you, our customer, whether that be the same products in new colors or completely new products to fill a void. One request we’ve continued to hear is the need for additional colors. About a year ago we began offering orange products and we heard rave reviews, but that we needed still more colors. So, we are happy to announce that we are now adding purple to our product offering. You will find that many of our most common products are now available in purple to allow you to expand your color-coding programs. Whether you need a shovel, floor sweep, utility cart or knife in purple, we now have you covered. We continue to look for more products in purple to expand our offering, but if there is something you are in need of, please let us know. Customer feedback is what drives our color-coded program and we encourage you to let us know what you need. Click here to view our new Color-Coded Catalog on our website, or call 800-826-8302 to request your copy today!